CALGARY, Alta. 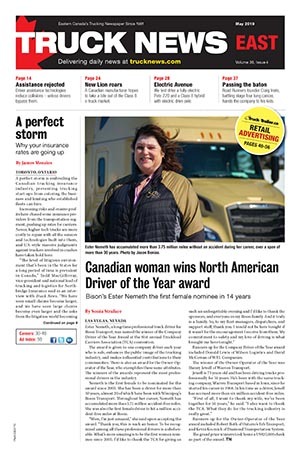 – The numbers are getting better, but Trucking HR Canada CEO Angela Splinter would like to see more women choosing the trucking industry as a career. During the inaugural Western Women With Drive event May 10 in Calgary – a collaboration between the Alberta Motor Transport Association (AMTA) and Trucking HR Canada – 115 attendees became privy to the myriad of ways trucking companies could entice more women to come on board, and how a lack of knowledge could be playing a role in why the industry remains dominated by men. As it currently stands, 27% of those working in the industry are women – 48% of Canada’s workforce is female. Of those 27%, 18% are senior managers, 15% supervisors and only 3% are engineers or technicians. Deborah Gee, an industry consultant and former driver who entered the industry though the Women Building Futures program, said during the ‘women in industry’ panel discussion that she started out driving with her brother as a team and eventually became the first solo female driver who traveled cross-country for her then employer. But it wasn’t easy. Gee feels the reason more women are not entering the industry is simply a lack of understanding that they are as capable as men to get the job done and get it done right. Judy-Lynn Archer, past president and CEO of Women Building Futures, said women looking to get into the industry need to first educate themselves on what the expectations will be. Archer said the trucking industry “still makes my heart race” but she doesn’t like seeing women working hard and not getting the same compensation as men. “It just goes against the grain,” Archer said, pointing out that the average annual full-time salary for a woman in Canada is $32,000. According to Statistics Canada, the average annual income for all Canadians is just under $50,000. Women Building Futures was launched in 1998 and helps prepare female workers starting careers in industries that have typically been dominated by men. Archer said women who complete the program enter the workforce with high expectations and a desire to land a long-term career, two things she encourages. Chelsea Herr, a welder with Mullen Trucking, also took part in the panel, and quickly learned from facilitator Dan Duckering to never say she is “just a welder,” or just anything, for that matter, as all aspects of the industry are vital to its success. Herr said there is a lack of awareness for young women when it comes to finding a career in trucking, as many believe it isn’t even an option. For Herr, much of her success stems from the support of her parents. “Without that I wouldn’t have continued with it,” Herr said, including that fact that like Gee, it wasn’t easy at first, as she was not always told from the get-go what the demands would be. “To some degree they were testing the waters to see if I could handle it,” she said, recommending women in any male-dominated industry to seize any and all opportunities that come their way. During another panel discussion – ‘road to leadership’ – the importance of leadership and sponsorship was a point of emphasis, and how both are vital cogs in getting more women into the industry. 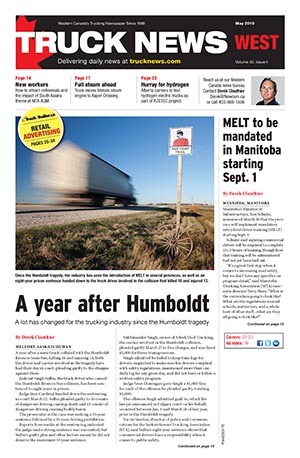 Grant Mitchell, president and CEO of Westcan Bulk Transport and AMTA chairman, said despite the importance of mentors and sponsors, everyone must discover and use their own strengths. Westcan has partnered with Women Building Futures and will have 12 female drivers enter the program’s new Class 1 driving session this summer. Mitchell said stereotypical perceptions of women in the trucking are an unfortunate reality, and in order to shed those images the industry must promote female success stories so women know what’s possible and available to them. He also advised any woman who feels they are working for a company that does not appreciate them to go out and find one that does. The Western Women With Drive event also included two keynote speeches, one from health and productivity expert Michelle Cederberg, and another by Karen Hamberg, vice-president of strategy for Westport Innovations. Hamberg emphasized the importance of networking to get ahead. But whether you’re a woman or a man, following your passion is what really matters when it comes to choosing a career path. Dan Duckering, president and CEO of Duckering’s Transport, facilitated a panel discussion on ‘women in industry’ during the first Western Women With Drive event in Calgary, May 10. The panel included Sue Timmermans, Judy-Lynn Archer, Chelsea Herr, and Deborah Gee. I love the fact women are in this industry. Manitoulin has had some fantasic women drivers . Alot of the problems I found is not with recruiting women drivers its the fact there is no support. We expect too keep up with anything it has too be a fair playing ground . Washroom for women one and a drivers lounge for women two.